When the best part of the movie features a pregnant Om Prakash, you know you're in a mess. Kanyadaan started out strong - with magically sublime (magicablime?) shots of a young Shashi Kapoor against a background of crisp mountain air, with soul-plumbingly beautiful music by Shankar-Jaikishen, with interesting 'war of the sexes' themes. It all went wrong though, when the narrative started veering off in irritatingly predictable-yet-insufficiently-alluded-to ways. Add to that, the main source of melodrama - country bumpkin Rekha's (Asha Parekh) inability to adapt to changing 1960s bourgeoise norms of marriage and divorce - was on pretty shaky ground, as no one seemed to be troubled by everything as much as she was, so her troubledness just looked more and more bizarre. Nay, attention-seeking! The usual Shashi way of dealing with things: get shashed. Consider, for example, one of the final scenes: after much drama, Rekha visits the Shash, who is currently Devdasing himself to death. Presumably her visit is out of compassion; it's an effort to prevent his suicide by bottle. The Shash proclaims, "Very well. I'll stop drinking because it hurts you. But what will I do? How will I live my life without this crutch? I just don't know. Sob." Goodness, such despair! And he thinks getting wasted is a crutch now? Never mind that it's been all of a week, get that man to an AA meeting. Or at least, I don't know, address what he just said. Instead self-centred Rekha goes, "I regret ever coming into your life." Huh? OK, we weren't talking about you anymore, you silly cow. Why must it always be you, you, you? But this is the film's fault. It can't seem to decide who the protagonist is. 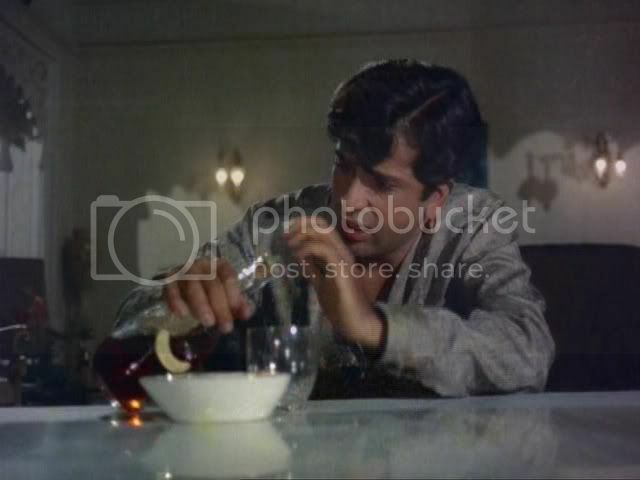 Is it Super Bourgeoise Man (Shashi Kapoor), the sensitive soul and poet, young, orphaned, rich, looking and acting as if he wandered out of an F. Scott Fitzgerald novel? Or is it his love, Bumpkin Woman (Bumpkini? ), poor despite her gallons of hairspray, who was a child bride, unbeknownst to everyone including herself and her supposed husband? Or is it even the Fred and Ethel neighbors? Who knows, who cares? It's always gotta be you, you, you, Bumpkini! Even when the Shash is burning up his Jawarhalal Nehru outfit and just kickin' it classic style. Look at him. Just look at him! He's hot. And he's so melodic when he's melancholy. And then there's the whole re-marriage issue, source of much needless angst. Bumpkin Woman wails and despairs and generally acts melodramatic that, alas, she is already married (even though she didn't know about it, and no one cares) and is therefore incapable of marrying the Shash. Meanwhile, her supposed husband - who, we'll give it away, is Amar the Fred character - was likewise unaware that he was already married, likewise got married, but the movie doesn't seem to fussed about this. He certainly didn't jump in front of the first speeding car when he found out (Bumpkini's typical response). In fact, the melodrama is then completely undermined in the end, when, after the Bumpkin Mom (Mrs. Bumpkini) has arrived from Eastcabumpkin, India, to see how her daughter is shashing it, even the freaking Mom - purveyor of all things traditional! maintainer of all things conservative! - tells her daughter, "Look, maybe you're taking this child marriage thing a wee bit too seriously." There proceeds a brief lecture on how child marriage isn't really valid if the children, as adults, don't recognize the union anymore, and, as interesting as it is to hear this coming out of a 1960s Hindi movie, it's still just horrible narrative form. We just spent 2.5 hours waiting for the last bastion of blindly conservative idiocy - sorry, Bumpkini - to wake up to the reality every other character seemed already fully aware of. Even more irritatingly, there are a couple subplots that are just overinflated balloons: when Ethel the Neighbor suspects Bumpkini of seducing Fred, or when Shashi appears to be going to the whorehouse and is actually just writing the play. What?! Ugh. Don't waste our time with this trash! Some genderbending: a woman smokes a cigarette outside the baby department! Anyway. Despite the horrible narrative form and just the horrible plot, this film is - like Jab Jab Phool Khile - another example of a very didactic but very aesthetically pretty 1960s film. The music is uniformly amazing, with two of the songs - Likhe Jo Khat Tujhe, and Mil Gae Mil Gae - reaching states of such transcendent bliss that our love of Bollywood was reaffirmed big time. Also, the camerawork is likewise very, very good - and it's interesting to note how Apollonian it is (compared to the Dionysian masala 70s? ): all rigorously measured golden ratios, geometric patterns, and so forth. Our absolute favorite moment in terms of filmmaking was during Likhe Jo Khat: Shashi and Bumpkini are frollicking around a tree in the usual forest. Just as the music pauses, Shashi grabs Bumpkini's hand and pulls her around to him, singing, "Kaha tum ho, vaha mein hoo." (Wherever you are, there I am.) During these lyrics, the camera pulls in tighter and tighter until we can see only her face pressed against his chest. That shot, we think, perfectly captures the delirious joy one would feel if singing at high altitudes with the Shash. And because of its transcendence, we'd say it captures any delirious joy, anywhere, anytime. 1. Mohammad Rafi sings for Shashi (sometimes - ed.). Yay. Editor who has been schooled in the comments: But not always! See comments. 2. Shashi has a shelf of hair and wears tapered trousers, like a true dork. 3. There will be 1 song featuring crisp mountain air and wooded areas. 4. The heroine's hair will resemble a beehive. 5. The moral of the story will be the oppression of women, or some variation thereof. 6. There will be a play-within-a-play. 7. At least someone will be super bourgeoise. Examples: this movie, Jab Jab Phool Khile (1965), Pyar Ka Mausam (1969), Abhinetri (1970), Sharmeelee (1971). OMG. Give us 70s masala anyday. Some movies are so-bad-they're-good. Others are so-bad-they're-just-bad. Now I have a whole new category: movies so-bad-they're-good-to-read-your-blogs-about. Especially when there are hot guys in the screenshots. I too hated this movie, although I desperately wanted to like it. The only good part that I remember is a miniature Asha dancing in a multicolored ashtray (it was the first trivia question I ever posted :-) although now that I think of it, pregnant Om Prakash knitting booties has to equal it. Oh, it's the ashtray movie?!? Fab! Are the clothes good? It seems like the clothes might offer rich potential for movie goodness. Sigh. He does look great. But I sure am tired of the oppression of women. And anarchivist, well said! I second that. Me again, sorry. 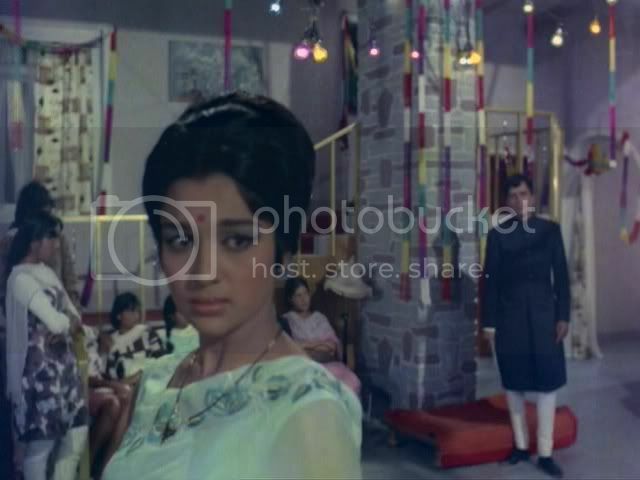 I just watched "Likhe Jo Khat Tujhe" and I was struck by how that's about the last song I would ever show to someone who has never seen a Bollywood picturization from the 60s/early 70s. It seemed to be made up of nothing but stock elements. Executed with great verve, to be sure, and by very pretty people in very pretty settings. Please note I'm not saying I didn't like it - but I couldn't shake the effect of "oh right, this is why some people hate Bollywood." Not a single dissenting vote - everybody (myself included) seems to dislike it! This movie gave a whole new dimension to female oppression. Most other movies had the heroine oppressed by cruel people or circumstances but here she manages to oppress herself with no help from the world at large! 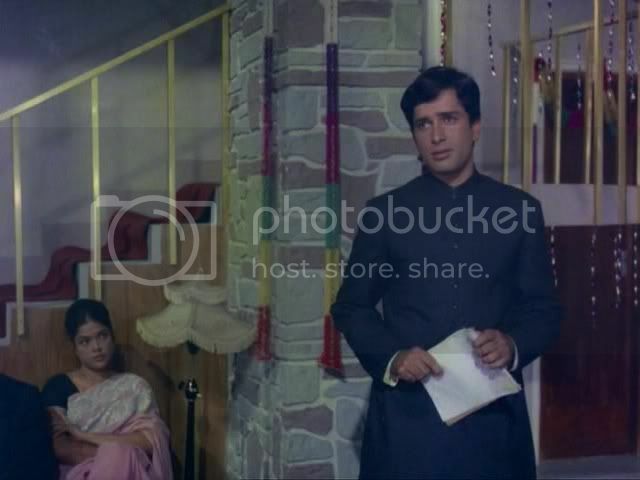 Like Sanket I have to point out a distinct lack of Mohd Rafi in one other movie in your list - Abhinetri has only one song lip synced by Shashi and it is sung by Kishore Kumar. Anarchivist - Ha, thanks! Yeah, there is a perverse joy in just eviscerating bad movies and/or movies with bad messages. Memsaab - OMG us too! We too wanted to like it, but it just kept pushing us away! Beth - The fashion and accessories are acceptably cool, but not quite as cool as they are in Duniya Meri Jeb Mein. Beth 2 - Awww, and we love that song! I guess it is 100% stereotypical. Ooh, but the air looks so clean up there! Sanket - Gasp! We have been schooled! Thanks, man. I'm thinking I prefer 60s Kishore to 70s Kishore then, at least in the romantic ballads. Bollyviewer - Well said! We're going to have to use your comment on our upcoming review of Bezubaan, another Shashi female oppression movie where the heroine manages to oppress herself. Yeah girl power. And d'oh, you're right about Abhinetri!! I was even listening to that song the other day and thinking, "Hmm, Kishore Kumar is so good in this." Sigh. My head. Mmmmm....Kishore Kumar is good in all times and places. I've never seen the movie (I'm guessing that might be a good thing though). Have to say, though... I love the songs. Especially Likhe Jo Khat Tujhe & Meri Zindagi Mein Aate. Free download Kanyadaan Songs, High quality MP3 .rar file.